During the past 30 years, researchers have made exciting progress in the science of learning (i.e., how people learn) and the science of instruction (i.e., how to help people learn). 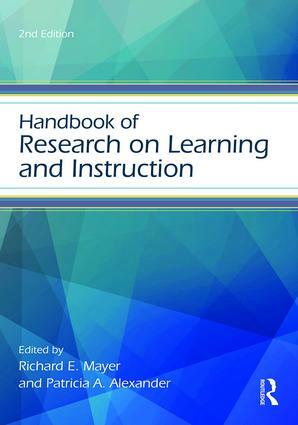 This second edition of the Handbook of Research on Learning and Instruction is intended to provide an overview of these research advances. With chapters written by leading researchers from around the world, this volume examines learning and instruction in a variety of learning environments including in classrooms and out of classrooms, and with a variety of learners including K-16 students and adult learners. Contributors to this volume demonstrate how and why educational practice should be guided by research evidence concerning what works in instruction. The Handbook is written at a level that is appropriate for graduate students, researchers, and practitioners interested in an evidence-based approach to learning and instruction. The book is divided into two sections: learning and instruction. The learning section consists of chapters on how people learn in reading, writing, mathematics, science, history, second language, and physical education, as well as how people acquire the knowledge and processes required for critical thinking, studying, self-regulation, and motivation. The instruction section consists of chapters on effective instructional methods—feedback, examples, questioning, tutoring, visualizations, simulations, inquiry, discussion, collaboration, peer modeling, and adaptive instruction. Each chapter in this second edition of the Handbook has been thoroughly revised to integrate recent advances in the field of educational psychology. Two chapters have been added to reflect advances in both helping students develop learning strategies and using technology to individualize instruction. As with the first edition, this updated volume showcases the best research being done on learning and instruction by traversing a broad array of academic domains, learning constructs, and instructional methods. "Two of the world's leading researchers in the area of cognitive processes and instructional design, Richard E. Mayer and Patricia A. Alexander, have combined the work of the major figures in our discipline in this edited collection. The result is a brilliant compilation of what we know about the learning sciences. It should be essential reading by all with a serious interest in this area. I expect it to be a critical source for years to come." "This is an extremely informative handbook of the research and theory on learning and instruction. The coverage is superb, the writing organized and accessible. Scholars, teachers, and advanced students will find this volume indispensable. You will be reaching again and again for this resource." Richard E. Mayer is Distinguished Professor of Psychology at the University of California, Santa Barbara (UCSB), USA. Patricia A. Alexander is the Jean Mullan Professor of Literacy and Distinguished Scholar-Teacher in the Department of Human Development and Quantitative Methodology at the University of Maryland, USA.